In the first part of our professional window installation, we covered why it is often better to leave home improvement projects to the pros. Top reasons include their skills and expertise, safety and security concerns, as well as insurance and warranty coverage. 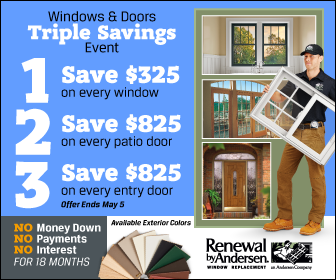 Today, we will discuss the things that set Renewal by Andersen® apart from any other windows company out there. There are no shortcuts when working with Renewal by Andersen of St. Louis. The difference is evident in every window replacement project our highly trained personnel performs. The commitment of our local team provides homeowners with dedicated local services and use them in the most effective way for members of the community. This allows us to deliver truly customized window products. Replacing your doors and windows is a quick and process for us. Our expert design and installation team has years of experience in our process and has been implementing it in communities in and around your area. From design and manufacturing to installation and warranty, all of it is uniquely Renewal by Andersen. As a full-service window and door replacement company, the peace of mind of our homeowners is our utmost concern. Renewal by Andersen makes it a priority to ensure the energy efficiency of the windows we make. The need to save time and money is something every homeowner can relate to. As such, each Andersen window is ENERGY STAR®-rated and certified. Renewal’s exclusive Fibrex® material and our Low-E glass packages is a testament to our deep underst anding and commitment to making energy-efficient windows. We at Renewal by Andersen st and behind every product we make and deliver with it comprehensive warranties and insurance coverages. This gives homeowners the peace of mind they deserve. The patio doors and replacement windows we install is insured by a fully transferable limited warranty, which includes original installation services as well as parts and labor. You won’t find any other window replacement manufacturer offering the same kind of protection you’ll enjoy when you choose us. There are lots of window companies and contractors out there vying to work on your home, but there is only one company that offers the distinct difference we do. Learn more about the Renewal by Andersen difference and schedule a free in-home consultation today. For Missouri residents, particularly Chesterfield, MO, call us at (314) 332-2364.